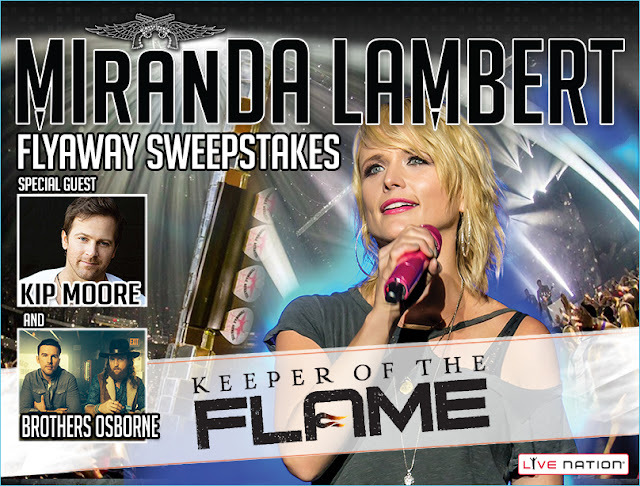 Live Nation has your chance to enter once to win a vacation to West Palm Beach Florida where you'll get to see Miranda Lambert's "Keeper Of The Flame" tour show and more! One (1) Grand Prize consisting of a Rock Flight which includes two (2) general admission pit tickets to see Miranda Lambert 'Keeper of The Flame' Tour at Perfect Vodka Amphitheatre in West Palm Beach, FL scheduled to take place on September 10, 2016 to include meet and greet with Miranda Lambert on the day of the concert; round-trip, coach class air transportation for two (2) from the airport nearest Grand Prize Winner's home within the U.S./Canada to West Palm Beach, FL departing on September 9, 2016 and returning on September 11, 2016; one (1) double occupancy standard hotel room for two (2) nights / three (3) days; and a 200.00 cash card to use toward ground transportation. This Sweepstakes ends on 08/11/16 and you can ENTER ONCE to win.